Confessionalization in Europe, 1555-1700 brings together a closely-focused set of essays by leading scholars from the USA, UK, and Europe, in memory of Bodo Nischan. They address what historians of the Early Modern period have recently come to define as the pre-eminent issue in the history of the Reformation, as they turn their emphases from the earlier part of the 16th century to the relatively neglected latter half of the century. By the time of his death Bodo Nischan had distinguished himself as a significant contributor to this central problem of confessionalization. 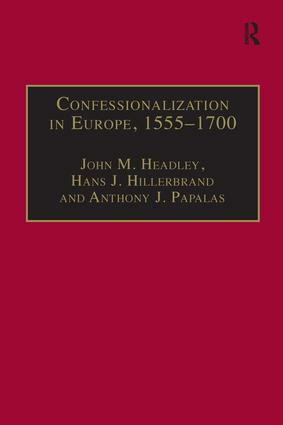 The concept involves the practice of 'confession building' which in relation to that of 'social disciplining', promoted interrelated processes contributing decisively to the formation of confessional churches, greater social cohesion, and the emergence of the Early Modern absolute state. Many religious practices, earlier considered as adiaphora (indifferent matters), now became treated as marks of demarcation between the emerging Protestant confessional churches and at the same time politicized as the early modern state sought to impose greater social control. Through the analysis of such liturgical, ritual, and ceremonial practices Nischan helped show the way towards a better understanding of the Reformation's engagement with the people. These are the themes treated in this volume. Contents: Tribute to Bodo Nishan, Anthony J. Papalas; The bibliography of Bodo Nischan, Anthony J. Papalas; Introduction, John M. Headley. Historical definitions: Confessionalization: the career of a concept, Thomas A. Brady, Jr.; Confessionalization: historical and scholarly perspectives of a comparative and interdisciplinary paradigm, Heinz Schilling; Problems of term and concept 'second reformation': memories of a 1980s debate, Harm Klueting. Confessionalization in German Lands: 'Founding a new church…': the early ecclesiology of Martin Luther in the light of the debate about confessionalization, Markus Wriedt; The Braunschweig resolution: the Corpus Doctrinae Prutenicum of Joachim MÃ¶rlin and Martin Chemnitz as an interpretation of Wittenberg theology, Robert Kolb; Johann Pfeffinger's treatises of 1550 in defense of Adiaphora: 'high church' Lutheranism and confessionalization in Albertine Saxony, Luther D. Peterson; 'Christians' mourning and lament should not be like the heathens' ': the suppression of religious emotion in the reformation, Susan C. Karant-Nunn; Astrology and the confessions in the empire, c. 1550-1620, Robin B. Barnes; Confessionalization and the campaign against prenuptial coitus in 16th-century Germany, Terence McIntosh; 'The queen of evidence': the witchcraft confession in the age of confessionalism, Thomas Robisheaux; 'The second Bucer': John Dury's mission to the Swiss reformed churches in 1654-55 and the search for confessional unity, Bruce Gordon; Catholic confessionalism in Germany after 1650, Marc Forster. Confessionalization beyond the Germanies: Fashioning reformed identity in Early Modern France, Raymond A. Mentzer; Confessionalization beyond the Germanies: the case of France, Mack P. Holt; Reconstructing the context for confessionalization in Late Tudor England: perceptions of reception, then and now, Peter Iver Kaufman; The formation of the pious soul: trans-alpine demand for Jesuit devotional texts, 1548-1615, Lance Lazar.